The bonus for the Dallas Cowboys: They’re all the way back in the NFC East race. Elliott ran for 121 yards with his TD and cash celebration as the Cowboys (6-5) won their third straight game since their first home loss, to Tennessee in the Dallas debut of Cooper. 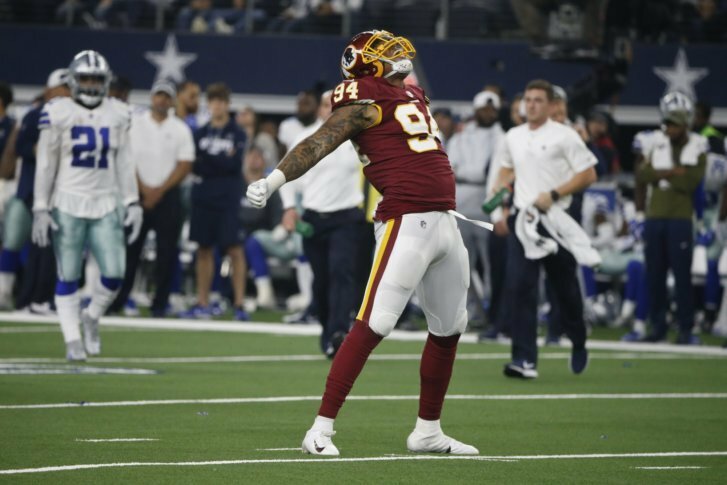 Dallas’ eighth win in nine Thanksgiving games against Washington, and second in three years, earned a season split. The Redskins (6-5) lost for the third time in four games in Colt McCoy’s first start in four years coming off Alex Smith’s season-ending leg injury. The longest catch of Cooper’s career and longest completion in Prescott’s three seasons came exactly a month after the Cowboys gave Oakland their first-round pick in the upcoming draft for a new No. 1 receiver. McCoy looked as if he hadn’t started a game in a long time early, throwing into double coverage on his first play and fumbling while trying to scramble on his third, with the Redskins recovering and punting. As a rookie in 2016, Elliott jumped into the kettle on the same part of the field after a touchdown in a 31-26 win over the Redskins. That season’s NFL rushing champion, who wears No. 21, was fined for the stunt and later donated $21,000 to the Salvation Army. Cowboys rookie receiver Michael Gallup had two catches for 19 yards less than a week after his brother died by suicide. The team gave him the game ball. He stayed with his family after last weekend’s game in Atlanta, and will attend the funeral Friday. Gallup didn’t talk to reporters after the game. Washington receiver Trey Quinn, the final pick of this year’s draft at the home of the Cowboys and a former player at nearby SMU, had a 30-yard punt return to the Dallas 25 to set up his own 10-yard touchdown catch for Washington’s only lead at 13-10 in the third quarter. Redskins running back Adrian Peterson left briefly in the first quarter with a shoulder injury but returned. Still, he wasn’t nearly as effective as in Washington’s 20-17 win in the first meeting. The four-time All-Pro finished with 35 yards on 12 carries after going for 99 yards at home. After the game, Peterson wouldn’t discuss his comments in a recent report that he still uses a belt and a switch to discipline his son. In 2014, he faced felony charges of child abuse in his home state of Texas before pleading no contest to a misdemeanor in a settlement. Corrects length of Trey Quinn’s touchdown to 10 yards instead of 14 yards.